New source of serotonin in the brain found and the effects on SSRI’s identified. Depression affects an estimated 350 million people worldwide and poses a major public health challenge, according to the World Health Organization. Researchers have discovered an unconventional way that serotonin is released from neurons that could play an important role in the mechanism through which antidepressant drugs work. The opensource study is published in the Journal of General Physiology. The team, from The University of Florence, explain that serotonin is a chemical in the brain that plays a key role in regulating various emotions and behaviours. Like other neurotransmitters, which relay signals between neurons, serotonin is stored in small sacs called vesicles in the presynaptic terminal of one neuron and released into the synapse in response to neuronal firing to bind to receptors on a postsynaptic neuron. An imbalance in serotonin signaling is generally thought to contribute to depression. Selective serotonin reuptake inhibitors (SSRIs) are a class of antidepressants that increase levels of extracellular serotonin by preventing its reuptake by neurons. The team explain that one of the main drawbacks of SSRIs is their delayed effect. The team state that a contributing factor to the delay is thought to be that the firing of serotonergic neurons is itself suppressed by extracellular serotonin, which acts on inhibitory neuronal ‘autoreceptors’ in a process known as autoinhibition. Thus, SSRIs, which are intended to enhance serotonin signaling, may actually initially slow the therapeutic process. The researchers show in the current study that the serotonin that mediates autoinhibition appears to be released into the extracellular space through a distinct process. Rather than being released from vesicles in response to neuronal firing in a process known as exocytosis, the current study indicates that this pool of serotonin may be supplied by simple diffusion across the cell membrane. The team surmise that a full understanding of this process might inform better strategies of modulating serotonin signaling in order to treat depression. 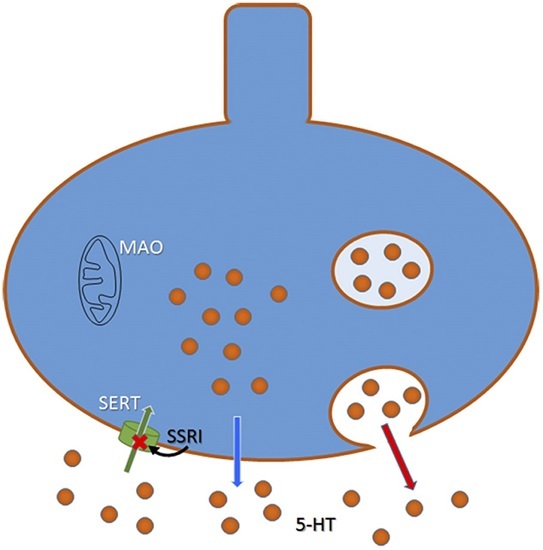 This schematic drawing of a serotonergic neuron shows exocytotic release of serotonin from vesicles (red arrow) and the nonexocytotic release described by Mlinar and colleagues (blue arrow). Reuptake of serotonin (green arrow) is blocked by SSRI antidepressants, increasing the extracellular serotonin concentration. Credit: Adell 2015.